If you’re like me, you eat, sleep and breathe horses, even if you can’t be at the barn. That’s why there’s piles of equestrian magazines, prize lists, and random pieces of tack scattered throughout my house (not to mention my car!). And lately I’m away from the barn more often than not, so when I heard about HorseLifestyle.TV, I was thrilled! No more searching for horse related videos, it’s all in one easy to use spot. people become the best they can be, for both them and their horse”. Carl Hester prepare for their equestrian events. I was immediately drawn to the George Morris Masterclass series, since it’s always been a dream of mine to audit one of his clinics in person (to be honest the dream is to ride in one, but lets be realistic!). or smartphone connected to the internet. 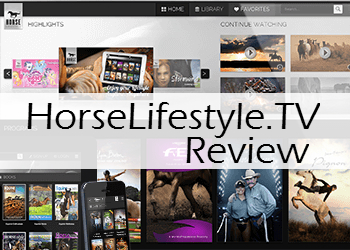 If you’re looking to get your horse fix, anytime and anywhere, then I highly recommend HorseLifestyle.TV!